Please be careful with her. Maaike starts kindergaten on Monday and I am terrified. She is so excited! I love that she is so excited and so ready but Im not sure the rest of the world is. As I'm preparing her for school we are doing all of the usual thing: buying a new backpack, crayons, markers, and good old Elmer's glue, but we are also talking. We are talking a lot. Talking about how to respond when someone asks her about her lip or tongue or why her cheek is so big or what the scar on her neck is from. Are you talking too? Are you telling your kids to be kind? Telling them to be brave and sit by the kid who is a little bit different? Are you reminding them about the whole book and cover thing? Please be careful with her. She is brave and she is strong and I know she will do great, but this mommy heart is a little tender, maybe too tender. I've sat by her bedside time and time again waiting for her to wake up from a surgery. I spend hours every week fighting the giants of insurance making sure she can get the best medical care. I hold her in the middle of the night through night terrors. I have slept on her floor watching her oxygen levels rise and fall. And now she will be beyond my sight and in your care. I know she will do amazing things no matter what you do, but please, for my sake, sit by her on the bus, invite her to eat lunch at your table, share your crayons with her, and see her for all she truly is. She is spunky. She is a bit of a smart aleck. She is loyal. She is funny. She is my Maaike. We have been racking up on sleepless nights. The diagnosis is a simple runny nose. The symptoms are continuous coughing, gagging on post nasal drip, and the vomiting. We are burning through sheets, pjs, and carpet cleaner, but this is nothing new. This is every runny nose and something that is par for course around here. I am a light sleeper, I hear everything. A blessing and a curse. I am usually awaken by coughing. I lay there listening, try to gage how bad it is and where it's going. Then the alarm sounds. Wrapped around Maaike's big toe is a laser sensor, glowing red, sending second by second oxygen levels and heart rates. If the numbers are below satisfactory the alarm starts to sound. Still I lay in bed. I'm waiting to see if the alarm stops, maybe caused by a long breath or a kick of the foot. I wait for two sounds of the alarm, if it goes to a third I'm up at her bed side. But last night there was no cough or alarm that woke me at this moment. This time she was calling for me, yelling for mommy. When I got to her crib she was visibly unset. I started to brush back her crazy locks with my hand and asked her what was the matter. "Bad dream. I had a bad dream." "Oh no." I said, "What happened?" "My friends were making fun of me." I continued to smooth back her hair until she was back to sleep. I climbed back into my bed too, but I couldn't fall back to sleep for she had just spoken of one of my worst nightmares. Miss Maaike is only two years old, three in May, so I can only imagine she was repeating something she heard one of her siblings say or that she was speaking of being teased in the most general sort of way, but I can't imagine that this is the last time I will hear those words and it will mean the most specific and hurtful sort of way. The momma bear in me wants to protect her from every stare or rude comment. I want to get vigilantly on any kids on the play ground who point or tease. But I know, "sigh", I know I can't. I cannot be the sword of revenge. I must be the voice of confidence. I cannot be the wrath of undeserved pains. I must be the love of healing. I cannot be there for every unkind thing done. But I will strive to prepare her to know of her beauty, to be radiant, to be strong. One day at the library we happened to chance upon this book. It is a charming tale, with wonderful illustrations, about a family with a little devil. At first the family is overwhelmed at the disruptions the naughty little devil creates in their lives and can think of nothing worst than life with him. Then one day there is a knock at the door. A tiny and smartly dressed devil is there with the offer of getting rid of their little devil and in turn she will move in and kept house for them. The family resists at first, but then their little devil does something to send them over the edge. Their little naughty devil is banished and the new one moves in taking over the entire house and causing absolute pandemonium. The book is written after and holds true to the old idiom, "Better the devil you know than the devil you don't." 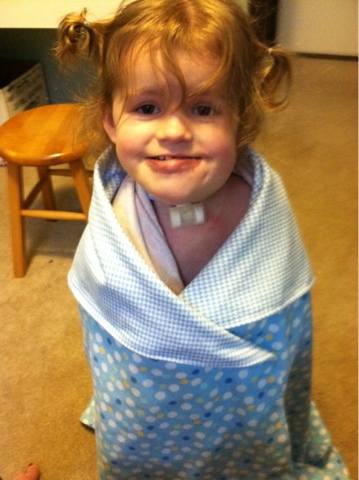 When Maaike first got her trach, at 1 month old, it was the devil. It changed everything about our lives, where we lived, what we could do, where we could go, our dreams and adventures were turned on their heads, and for awhile I wasn't sure how we would ever recover. 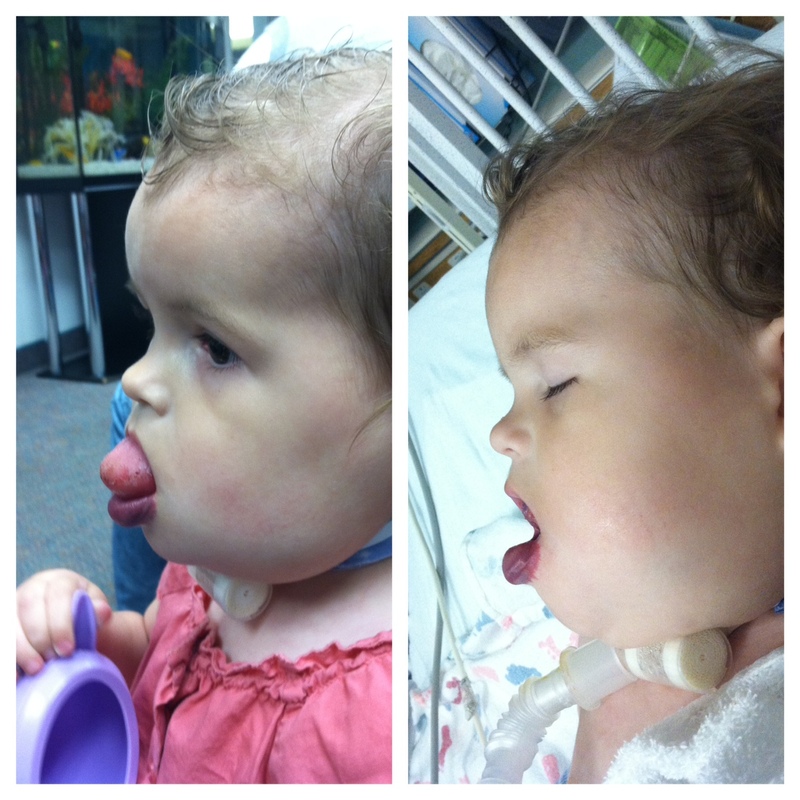 But, with time and familiarity her trach became "the devil we knew." It still very much changes our lives, but I'm not afraid of it anymore and in deed I am thankful that a little devilish piece of plastic preserved her life and allowed Maaike to bring us the immeasurable joy she has. I have dreamed about the day when Maaike would be decannulated and we could throw her traches in the trash. I have longed for the days when we don't have to divide our family activities, but we can all go together, cold and flu season or not. It seems too good to be true that those days may be coming upon us. And to be honest, I am terrified. Could we be trading the devil we know for something much worse? I fear sudden swellings and flareups with no sure airway. I fear surgery and recoveries without easy access. I fear it is too early. I fear emergency phone calls and CPR. I fear the worst. I fear my fears. I fear the unknown. 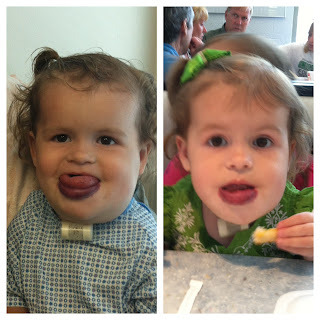 Maaike calls her trach caps "bottle caps". She is adorable. And, she is doing well with them. The process is pretty quick. Start with 2 minutes the first day, then 4 the next, and continue to double each day. 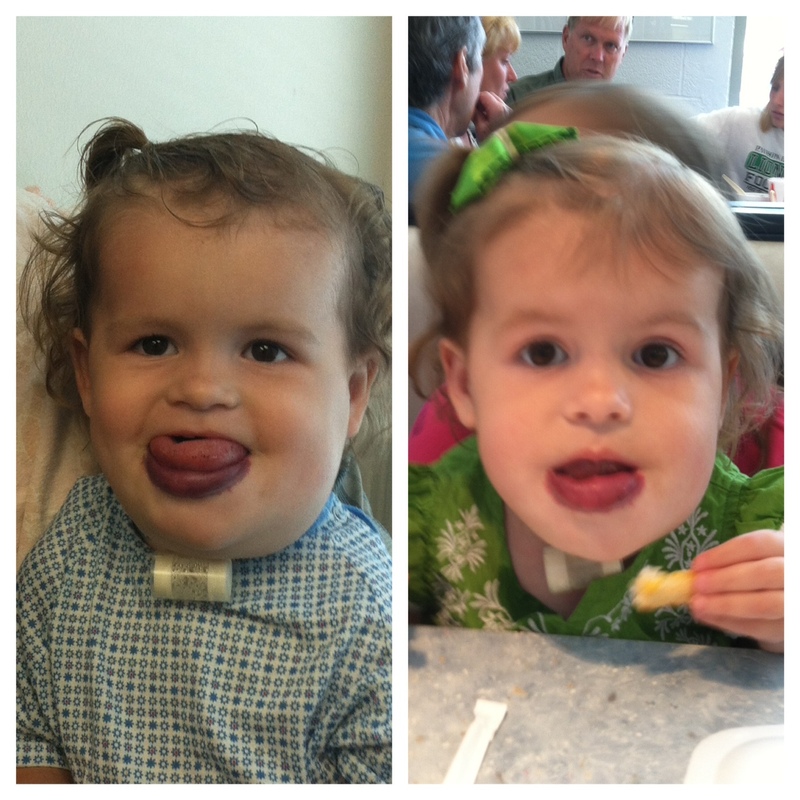 In the span of a couple of weeks you come to having the trach capped for eight hours a day. We are almost there. The next step is a capped sleep study at the hospital. This will be very telling to whether she is really ready or not. If the answer is "Yes" then they basically pull out the trach and stick a band aid over it. In 15 minutes it will start to heal itself. Unlike an earring hole, a trach hole or stoma, doesn't patch itself into permanency, it is an open wound held open only by the trach and once the trach is removed it will start to heal itself. Amazing really. So here we are, familiar and resolved in a trached life that looks to be turned up on its head again. I suppose we will adapt as we did before and always have. I suppose I most fear a false sense of hope, but whether I am ready or not I have a marvelously spunky two year old who has grown and overcome against so many odds and if she is ready then I will be along for the ride. Who are you? I think we should meet. Hi, my name is Rian. I have a daughter with a trach, she has lymphatic and vascular malformations. I started this blog so I wouldn't feel so alone in our journey. I'm thrilled to meet you. This photo was taken on Halloween 2011, the cutest Yoda ever. Maaike was one month out from her first sclero therapy treatment (Sept 29, 2011). Here we are one year later, Halloween 2012. It is amazing the difference a year can make. July 2012 move up the mountain to the house where I wish to remain until the day I die. Really. So much has happened with Maaike as well. She has healed up nicely from her tongue reduction and is making real strides with the Passey-Muir valve. We did a coblation laser treatment to her tongue and lip that caused massive swelling and in the end produced no results. We are gearing up to have her tonsils and adenoids out in December to help open up her air way a little more. And some other stuff that I can't remember. But, what I really want to talk to you about is hibernation. I'm worried this year. In years past she was too small to notice that she was always left behind. She never cried when we the rest of us went off to a holiday party, Sunday church meetings, or the grocery store. This year she is painfully aware. Her first questions of the morning are usually: "You not going?" and "I going too?" I'm not sure how to handle it. I have ramped up the crafts and books, but I'm wondering what you do. Any suggestions? I'm thinking about getting a little indoor slide for her for Christmas. I'm wondering about trying to find someone to come and do a gymnastics class at our house. Or dance? Maybe art lessons? Something that is her special thing. I'm wondering if I can find a fun 12 to 16 year old that would want to do it. Brainstorming phase here. Any other ideas? It is hard to be so protective when she is doing so well. I want to take her everywhere and let her experience everything. I have to remind myself that this year we don't have the protection of the synergist vaccines (RSV vaccine) and that she still got RSV with the vaccine last year, though thanks to the vaccines it was mild. But, we have to do what we have to do. And more than just enduring it I want us to enjoy it. Time to put on our thinking caps and work together. DC Friend: "I had this idea of making some business cards for Maaike. Maybe a couple of different ones. A sweet one that tells a little about Maaike and her story that you can hand to courious strangers. And one that says "F- OFF!" when you've had enough." Me: "Fantastic! We'd love them!" DC Friend: "Hey Sweetie! I'm working on Maaike's business cards, and want to include some information about things she likes. Can you tell me a couple of simple things? Maybe she likes music or warm water - or whatever it is. One of the things I'm thinking of including is that she loves being with her big brother and big sister!! Will totally let you see / approve the cards before they get printed so you get final word on everything!" Me: " Let's see... Maaike is such a champ. She totally rolls with whatever we throw at her. She loves doing whatever her big brother or sister is doing. She loves to swing. Her favorite song is "The Wheels on the Bus" that she plays non stop on the I-pad. She loves playing in the bath, but not getting her hair washed. She is really witty and gets a kick out of teasing us. If anyone is coming in the front door she runs and hides, usually under a blanket in middle of the living room so that she will quickly be found. Her favorite food is chocolate milk and since her last surgery, the tongue reduction, she is learning how to kiss with her lips." Can't wait to see what she is coming up with! She is an amazing friend. And I commented this: "Can totally relate. I want people to feel free to ask questions about our daughter, but sometimes I just want to talk about trashy TV too. We just moved again so the questions are all stirring up again. Last week we were invited to a birthday party as a family, but the birthday boy admitted to our older daughter that he didn't want Maaike to come because he was scared of her. We of course brought her anyway, but its a work in progress. I know one mom in your SNS posted about business cards for SN kids. Ironically a few days earlier and friend of mine in DC offered to make some for me. 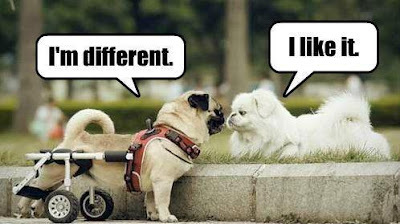 I'm hoping the cards will be a great way to allow families to discuss differences and how differences are beautiful. So that when we find ourselves in the next playground situation I can pull out a business card, hand it to the kid and say "Go have your mom read and explain this to you. It'll answer your questions and tell you how special our little one is." 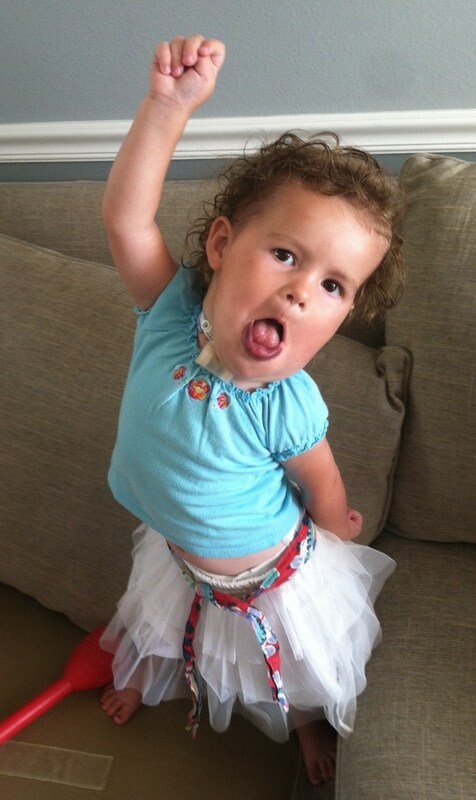 The week leading up to Maaike's tongue reduction was over shadowed with nerves. Every time I looked at her protruding sweetness I felt sad. The surgery was a necessary evil in my eyes. I want her to have everything our other kids have. I don't want her to have to go through more dental surgeries and a possible jaw surgery, so of course we are going to do it, but I am sad to lose a piece of the girl we love so much. I think my husband said it best. "Part of me selfishly wants her back the way she was, which was perfect to me." We stayed in the hospital for 6 days while she readjusted, fought fevers, and vomiting, and we all took a giant sigh of relief to be on the other side. Since the time that Maaike was born it was clear that her tongue was too big. Such a crazy thing. A abnormality that I would have never thought of. What was unclear was what needed to be done about it. Would she grow into it? Would it grow bigger with her? Would it function? Could we chemically shrink it? Would we have to medically remove some of it? I prayed and hoped and wished on stars that we could avoid putting it to the knife, that one day it would magically shrink, but it didn't. When Maaike had her dental restoration surgery we discovered her tongue's first ugly secret: the weight of her tongue was causing her roots to dissolve under her bottom teeth. Then, at our last appointment with our ENT the second secret came to light, that her bottom jaw was thinning and protruding to accommodate her tongue. It had to go...at least part of it. Is it weird to lament the lost of a tip of a tongue? Am I crazy that I cried just thinking about that ounce of flesh ending up in a garbage can somewhere? Would it be incinerated? End up in the land fill? In the end it didn't matter. It needed to go...for the love we feel for the tip of her tongue is only the tip of the iceberg. She said exactly what I felt. "Five years ago I learned that even though my life had changed, even though taking my third daughter home wasn't what I had planned, even though, while my world had stopped, others lives were still moving along, and that what I had been given was every bit as wonderful as what they had been given. Even though I might mourn the loss of what might have been, I still love what is." written by Somer, the trach mom who coached me through the first year of Maaike's life. 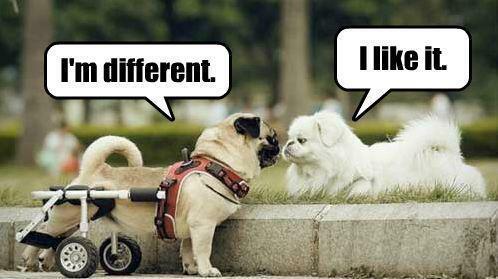 I was recently invited to a Facebook group for people of my same faith that have special needs children and this morning someone from the group posted this picture. It is wonderful to feel connected through our different challenges. It is hard for me to reflect back on Maaike's first year of life. It was such an isolating time. But just before Maaike's first birthday we stumbled upon Liam and Kody and realized that there was someone else out there like us. Liam's parents then opened us up to the rest of the Lymphatic Malformation community through their foundation and a few Facebook groups. The feelings of connection, acceptance, and understanding have pushed the dark clouds of that first year far behind us. I would however caution you to make sure you find a group that meets your needs. There are tons of groups, blogs, and websites out there. Each group has its own focus and personality and it needs to be a good match to your needs and personality or it could become more of a setback than a help. I hope coming here, to this blog, is a help for you. It is for me. Where in cyber space do you find acceptance and peace? Maaike's last surgery was for dental restoration. We used to lovingly call her snaggle tooth. Now we call her chiclet. 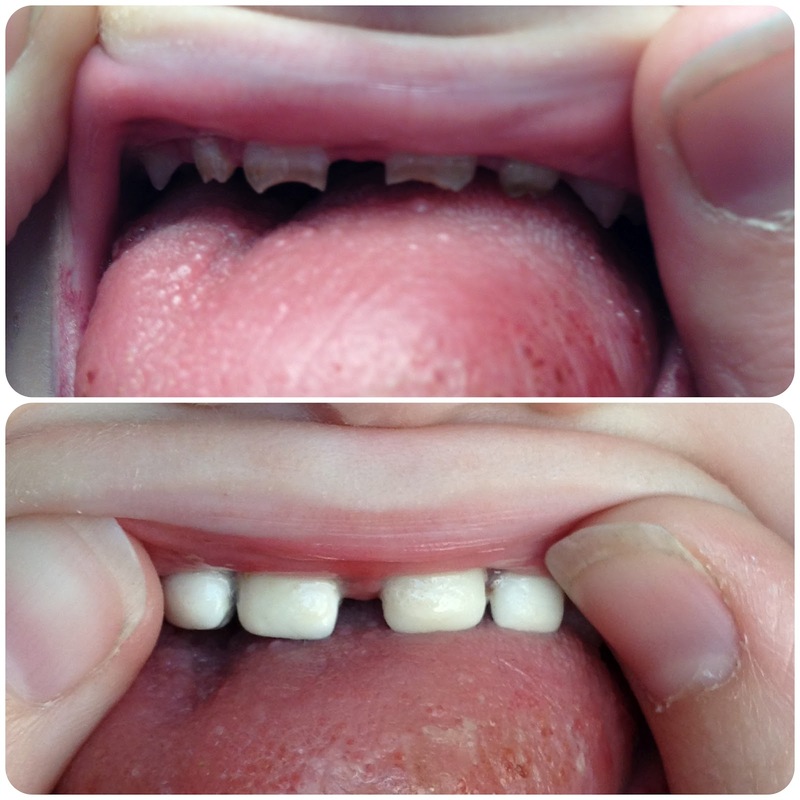 Trach kids are notorious for bad teeth, in fact many special needs kids have weak dentin. I'm not sure if it's because the body is fighting so many more life threatening battles or if it simply has no time to send a little calcium to the teeth or if its just a product of an exhausted mother giving in to a bottle of Pediasure at bedtime (just speaking for myself here). But, the American Academy of Pediatric Dentristy does have a few things to say about it. Many trach kids have chipped teeth from being intubated so many times before they were trached. We don't have that excuse. Maaike was trached at 1 month, just 2 months before her first tooth arrived (crazy I know. Of all my kids why did her's have to be the one to come in early?). Her dentist suspects that she had some low grade trama to her teeth, aka bumping her teeth while learning to crawl, and then the Pediasure did the rest. It is such a catch-22. Maaike stuggles to keep weight on. She burns so many calories just breathing. Then we found this great product, all-be-it crazy expensive, that she will drink and helped her to finally put on some weight, but it is eating her teeth alive. You just can't win some times. Thank goodness for baby crowns. Along with a few pieces of Easter candy, Maaike and our other two kids found electric tooth brushes in their baskets this year. They were all thrilled at the thought and sound of them, but have really struggled with the "feel" of them. But, we are not giving up. We are weening Maaike off the Pediasure as we speak and are hopefully ensuring her a future filled with pretty princess crowns and not baby teeth crowns. But with new blessings come new problem solving. Between the nurse, my husband, and I it became a little confusing who was doing what and what had and hadn't been done. Light bulb. 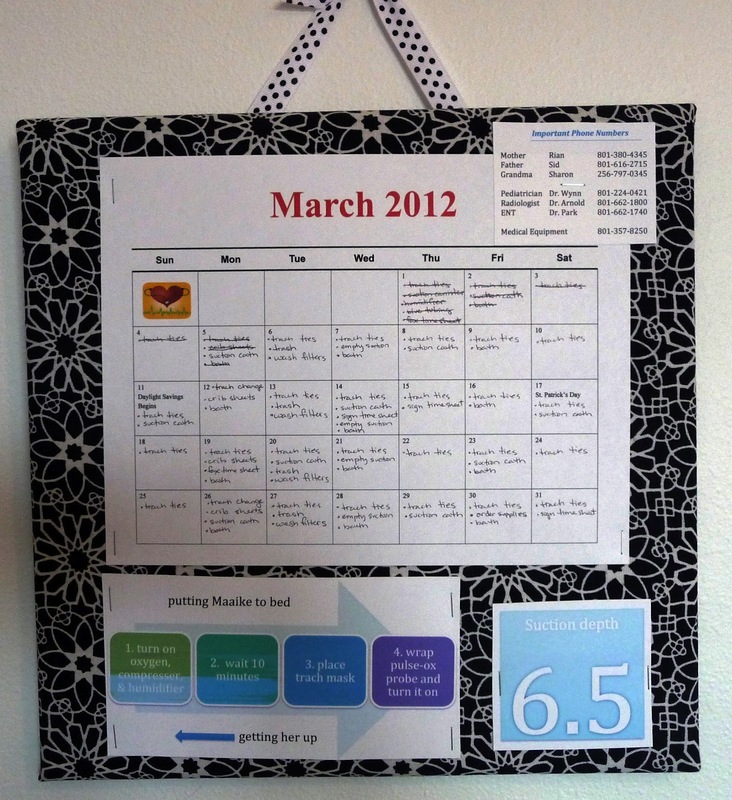 Make a medical task list calendar. Problem solved. Its so simple, but so effective. I've hand written what needs to be done each day and then we cross it off as it happens so the next person knows what is left. 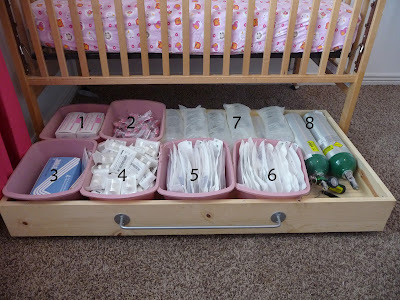 I put everything on the list, from trach changes to emptying the diaper pail, from changing out the suction catheter to signing the nurses time sheet. Revolutionary. I need one for each kid. You can also see I've got Maaike's going to bed instructions, suction depth, and important phone numbers on her board. 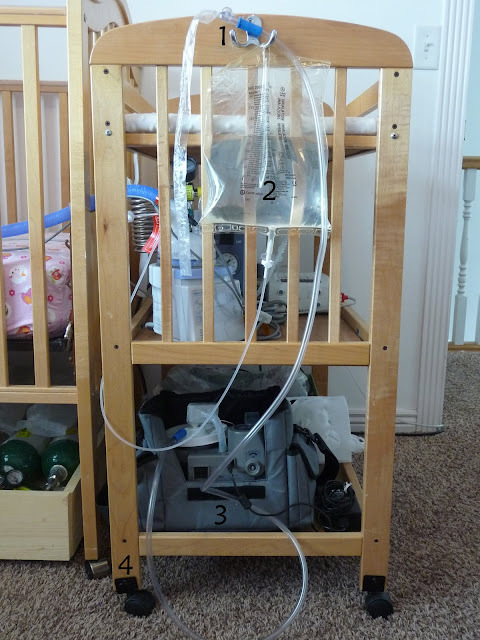 I hangs on the wall by the changing table (aka trach command center). I am patting myself on the back for this one. Occam's razor wins again! On July 2nd we will have our 2 year anniversary since being trached, and by saying "we" I am absolutely implying that it happened to our whole family. It really has changed our lives in so many ways, but I assure you that one of those ways was better. Our lives are indeed more scheduled and at home, but we are happier than we have ever been. I remember the night we got home from the hospital and all of Maaike's gear came in the door and I wondered if we would ever find normal and happy again. I wish that me could see us now, because she would have known that everything was going to be alright. That first night home we didn't even have a home. I went to my mother-in-laws and had planned on putting Maaike in a port-a-crib. When the RT showed up will all the machines he looked at me very lovingly and broke it to me that this was not going to work. An army of family was instantly mobilized. One brother-in-law ran to Walmart to buy a crib mattress. Two others went to a storage unit to find their crib and changing table for us to borrow. My mother and father-in-law started clearing space for the crib and gear, while the RT started spewing out pressure gauge numbers and temperatures in Celsius. oxygen concentrator tubing- the concentrator is the one thing that doesn't fit on the changing table. suction machine- I have it apart from her other machines because for us it is the only one that moves one a regular basis. I have easy access to it here and don't have to fumble with the other machines. wheels- these were a life saver in the beginning when Maaike was on the machines all day and we would wheel her out for family time, but they continue to serve us now when we travel. 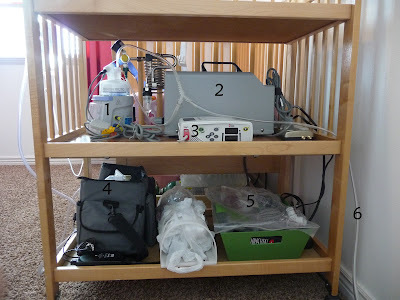 The machine stay on the changing table as we roll them out to the car, drop the whole thing in the back of the minivan, and then roll them right into our room (photos here). This post is the first in a three part series on organization. 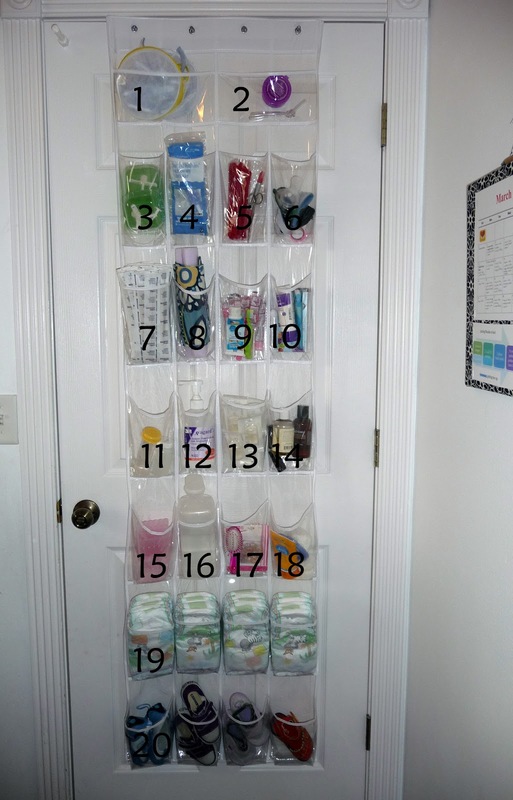 Some of you will instantly know that traches and organization go hand in hand, or at least that is the goal. For those of you who are scratching your heads let me explain that every month I get a delivery of roughly 256 medical thingies. 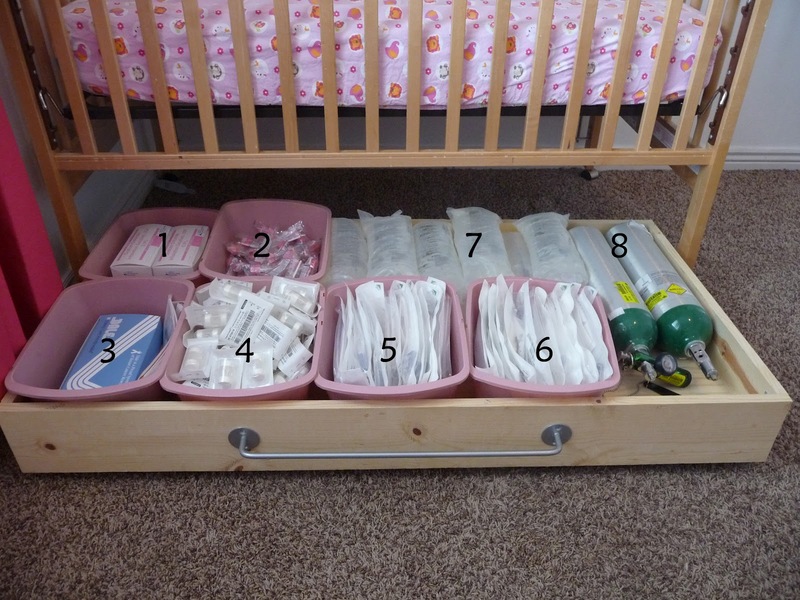 That is counting Q-tips, artificial noses, and saline bullets individually, but there are 15 different types of thingies in there. My system works great for us, it may not for you, but hopefully some idea may be helpful in devising your own strategy. 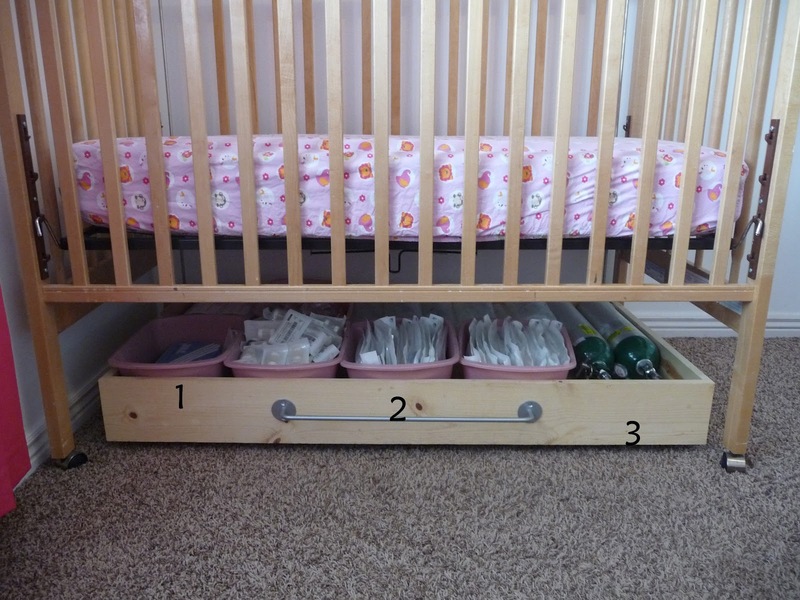 low profile- if you make one of these I would recommend keeping the height minimal for that it will be versatile for crib or bed. wheels- for an easy glide in and out, wheels are a must, but don't get swivel ones or the drawer will go all crazy like. I strongly recommend the straight forward and back wheels to ensure a clean roll out every time. 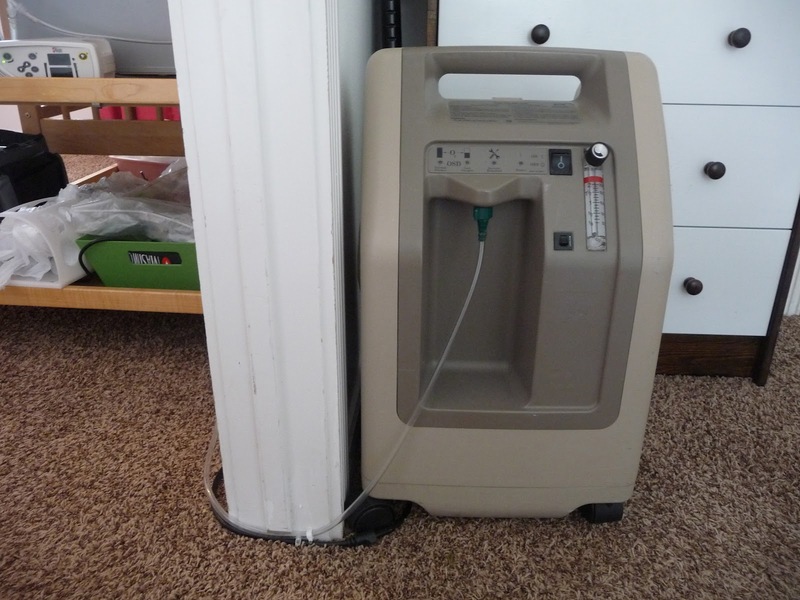 The next two organization topics will be medical equipment (aka the machines) and medical tasks (the daily trach to-do list). Questions? Comments? Concerns? Talk to me. Our family recently sold almost everything we owned to follow a dream of moving to China. While there our third child was born with cystic hygroma. Her condition necessitated our speedy return to the States and set us on a whole new path. At 32 days old her tracheostomy was placed and I became a trach mom. Now we are setting out to accomplish new dreams as a family of five.